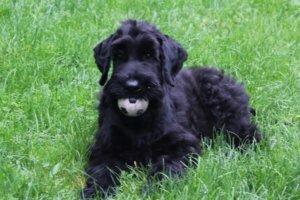 The first schnauzer in our family was a female Bela of the Lubin Valley.Her father was Illo of the Long House, an excellent dog both in appearance and in work performance. 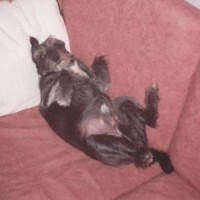 His grandfather was the quite famous dog Ogar v. Bartenverzer. 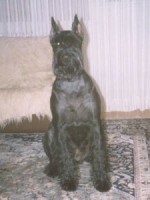 Bela , a nice female with good exhibition awards,had not been bred for HD 2/3, however. She passed a way unexpectedly in 1999. Remaining members of the pack at our place are . Adéla a smooth-haired female pincher, Dan - the foundling and Ben -another foundling. Let us not forget our cat Zigi.